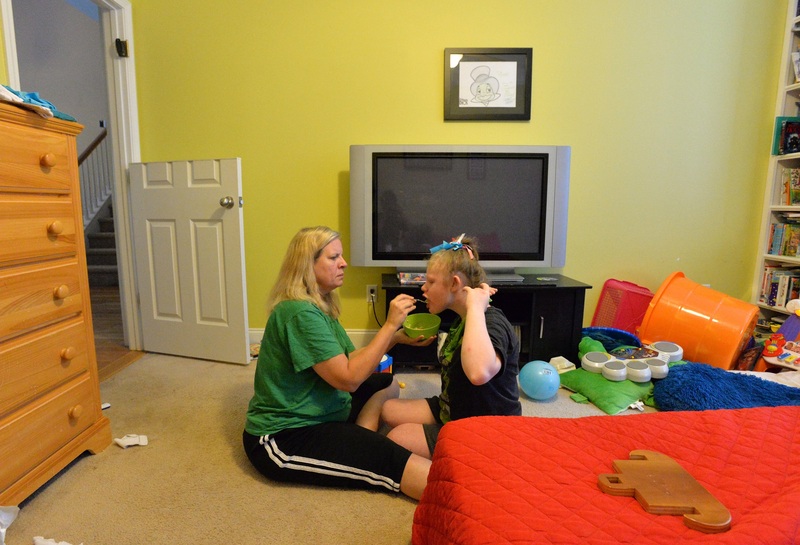 By Jim Tharpe on Thursday, December 25th, 2014 at 12:00 a.m.
Kelli Hopkins feeds her daughter Michala, 16, in their Covington home in September. Michala suffer from a seizure disorder that could be treated by cannabis-based oil that may become legal in Georgia. State Rep. Allen Peake on Dec. 3: Unlike marijuana, medical cannabis oil cannot get you high. State Rep. Allen Peake, R-Macon serves as co-chairman of a joint legislative committee that has studied legalizing medical marijuana for certain conditions, including seizures in children. His bill would allow cannabis oil, made from marijuana plants, for treatment of certain seizure disorders and other health problems. Confusion about the oil form vs. a smokable drug has prompted Peake to speak out. "We believe that the medical cannabis oil – very low in THC, that doesn’t have a psychoactive component to it, cannot get you high – is a better approach for our citizens," Peake said during a recent press conference before a committee meeting. PolitiFact’s research shows Peake is correct. The main component of the plant used to make cannabis oil doesn’t have the mind-altering, munchies-inducing effect associated with street use of the plant. We rated Peake’s statement True. State Rep. Greg Morris on March 13: You can buy lobster with food stamps. State Rep. Greg Morris, a Republican from Vidalia, was battling for a bill he authored that would require food stamp recipients to be drug-tested. Morris was asked why no one else spoke in favor of his legislation, House Bill 772, as opposed to representatives of legal groups and other organizations who said they were against it. "What lobbyists are there for just the average worker who’s a taxpayer?" Morris said. "They’re economizing and buying inexpensive cuts of meat, when with (food stamps) you can buy lobster." So, food stamp recipients can buy lobster. Is this true? PolitiFact’s research indicates Morris is correct. At least in theory. It’s unknown how many other food stamp recipients are cracking open this yummy seafood from its shell. A Fox News video showed there is at least one person receiving those federal benefits who bought lobster. The man did say he does so if it’s on sale. We rated Morris’ statement True. Atlanta Mayor Kasim Reed on Jan. 31: The annual gross domestic product of metro Atlanta is "bigger than 28 states in the union." Atlanta Mayor Kasim Reed talked about the economic might of the region during a speech before the Atlanta Press Club. The annual gross domestic product of metro Atlanta, the mayor said, is "bigger than 28 states in the union." Is it really that large? "Atlanta is a huge metro area," said Jeff Humphreys, the director of the University of Georgia’s Selig Center for Economic Growth. "The population would outrank a lot of states." Indeed, metro Atlanta has a larger population than 30 states, U.S. census figures show. We rated the mayor’s statement True. Gov. Nathan Deal in a speech Feb. 26: Georgia has saved $20 million through changes in criminal sentencing. The Great Recession forced many elected officials to rethink their approach to governing in some areas. In Georgia, it has resulted in a philosophical change that has saved the state millions of dollars, Gov. Nathan Deal said. Deal said the changes in criminal sentencing adopted in 2012 have helped Georgia’s bottom line by about $20 million. A PolitiFact Georgia reader saw an article that outlined the claim and asked us to check it out. We wanted to know whether the governor’s numbers were on target. Or should he be sentenced for faulty math? PolitiFact crunched the numbers. State data show there has been a $20 million decrease in the amount of money spent housing state inmates in county jails. We rated the governor's statement True.